The Bingham Diaries: Yes, I really notice things like this. Yes, I really notice things like this. I'm pretty sure the Barq's root beer can was designed for left-handed people. No seriously. Because if you hold it in your right hand, you cover up the label and what shows on the other side is the nutrition information, which as we all know is like, 87 grams sugar, and some root beer extract or whatever it is that they actually use to make root beer, and a little bit of caffeine. POINT IS: there is no nutritional value. But I thought that left-handedness was the recessive gene and therefore less dominant, so wouldn't it make more sense for the Barq's design to be the opposite way? So that when the right handed people are drinking it, the label shows clearly? 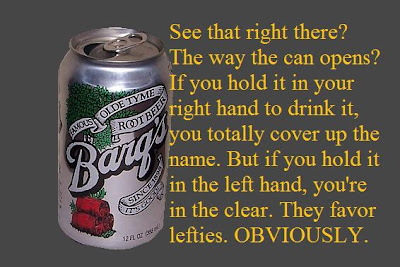 Or do you think that Barq's only wants left handed people to drink their soda? Or do you think they never even thought about it, and now since someone finally noticed it, that there will be a big soda scandal? Meanwhile, I went to the website to swipe a picture of a can and was distracted by all the shiny sparkly things. Such as this: did you know you can become a Barq's deputy? And then you get to try and catch Barqy? Who is destroying the Barq's website? And Barqy is a cute little dog made out of a soda can? *okay, let's get real. The real monstrosity is how much I love run-on sentences. I've never met one I didn't like. For reals. And I'm kinda ashamed that this little *asteric* isn't one big sentence. I'll try to do better in the future.